What is the Conair 3QMS Hair Dryer? The three Q's in the name stand for Quick, Quiet and Quality. This hair dryer helps speed up drying time, makes less noise and runs 10x longer than a typical hair dryer! If you're like me and dry your hair a lot in the fall and winter months, this is a must-have! Quick | Hate spending forever drying your hair? Me too. 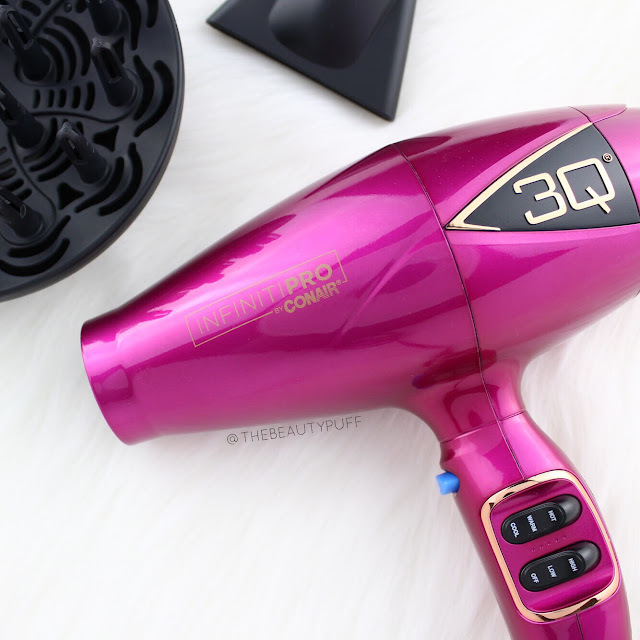 The Conair Infiniti Pro 3QMS features an energy efficient motor that helps dry hair more quickly with a faster air speed and lower temperature to help reduce damage. Quiet | Faster air speed doesn't have to mean more noise! The Conair Infiniti Pro 3QMS is about 40% quieter than a standard hair dryer while still providing enough power to get the job done efficiently. Quality | While I've used countless hair dryers in my life, I never really thought about how they work and why they wear out so quickly. Most hair dryers have carbon brushes which wear out before 500 uses. The Conair Infinit Pro 3QMS uses magnets instead to extend the life of the hair dryer to up to 10x, about 5000 uses! So it basically saves you time and money - love. Features | The Conair Infiniti Pro 3QMS comes with a diffuser and air concentrator attachment. It features three temperature settings and two speed settings. The lower speed and temperature are ideal for fine hair while the higher settings are ideal for thicker hair. Its ergonomic design is lighter than standard dryers so it's more comfortable to hold while styling too. You'll also see up to 75% less frizz thanks to its ion technology. Less styling time with smoother, shinier hair is definitely what I need when the air gets dry in the fall and winter! Final Thoughts | I love the light-weight, ergonomic design of this dryer. It's comfortable to use and keeps my styling time to a minimum. I use the warm setting to get my hair about 80% dry, then turn it to hot when it's time to style with the air concentrator. I noticed both steps take less time and I'm left with a soft, frizz free look that holds up until my next shampoo. I can't wait to see how my hair improves this fall and winter. You can find this hair dryer below on Ulta's website!